There is a culinary canon I associate with my Aunt Nancy’s beach house on Fire Island, just outside New York City: fried clams from the ferry dock, pasta with herbs pulled from the barrels on the wooden deck, Goldfish crackers from a bag on the beach. But no dish conjures Fire Island memories more than my mom’s blueberry muffins: sweet and cakelike, their sticky summits dotted with damp indigo berries and sprinkled with buttery crumb topping—miniature sandy-topped landscapes of tan and blue, tiny beaches unto themselves. The family life that brought us the blueberry muffins slowly fell apart, but the recipe for those summertime reminders remains. Though I grew up in St. Louis, my parents are New Yorkers. Every summer, they took my sister and me on a road trip to visit our grandparents upstate and in New Jersey before the grand finale: the ferry to the village of Saltaire, on Fire Island. Our hosts there—my Aunt Nancy, Uncle David, and their daughter, Hannah—were not actually related to us by blood. David’s brother is married to my father’s sister. In the years following my parents’ divorce, David and Nancy proved it was their love for my mother, rather than any familial obligation, that bound them to us. Maybe it was my mother’s muffins that first endeared her to them. The recipe came from a cooking class at a St. Louis kitchen store, and it was an instant family hit. As a kid, I would carefully line the baking tins with pastel-toned paper cups, sneaking batter-coated berries from the bowl. I can’t remember whether my mother would use the kitchen of the last relative we’d visited, or bake upon arrival in Saltaire. But by the first morning, when we ambled into the house’s sunny kitchen, a basket of blueberry muffins would be front and center on the wooden table. I would savor mine while gazing at the Fishes of the Atlantic poster, considering the great white shark, and whether I was too old to choose the protected swimming bay over the Atlantic beach for one more year. Fire Island summers meant unprecedented levels of independence. My very first steps took me across the wooden deck where Nancy spent days deepening the complexion of her olive skin on a lawn chair, devouring best sellers while David, a compulsive cleaner, continuously swept away the pine needles that peppered the planks. In the years that followed, steps across the deck became expeditions to the general store, Saltaire’s single place of commerce. Hannah and I would march barefoot through aisles of Coca-Cola and Coppertone and charge ice cream cones with rainbow sprinkles to her family account. We would sit on the bench outside, melting sprinkles making sticky rainbows on our little wrists, and watch the flirting teenagers and off-duty lifeguards with fascination. Day after day, like this we’d stay—up in the mornings, munching muffins under the Fishes of the Atlantic, followed by some semblance of sunscreen, sand, and splashing in the waves. While Saltaire summers remained blissfully predictable, life in St. Louis began to crumble. My dad still lived with us, but rarely got home before we were in bed. Family dinners, once a nightly ritual, became torturously tense before being abandoned altogether, each of us retreating to separate corners of our big brick house. Sometime around the summer when lifeguards started to notice me, our family of four faded to a duo of my mom and me. My dad disappeared from those summertime trips, and my sister preferred vacations with a friend’s family of five giggling siblings. Suddenly, I felt the escape for my mother was real. Cooking for Nancy and David, dozing on the deck, and jogging to the lighthouse brought back a happy, mellow mom who had become a memory to me. Who knows what she talked about to Nancy on the deck while I basked on the beach? My father’s infidelities, her fear of a rapidly approaching empty nest? Maybe all this went unsaid, but it was clear that in Saltaire we had a refuge from the turmoil on the mainland. Somehow, a strip of sand half a mile wide became our harbor of stability. 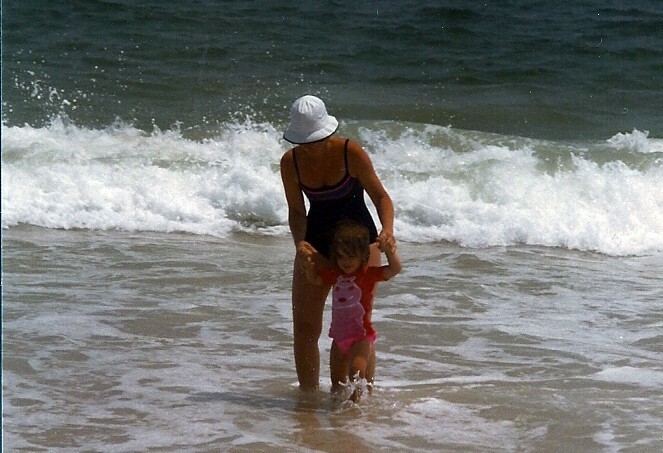 Even from college in Santa Barbara, I would return east to Fire Island with my mom, who had left the old brick house in St. Louis for a light-filled cottage for one. Several years ago, I moved to Manhattan and began to understand the importance of finding refuge for myself. The transition to adult life, barreling along at subway speed, left me longing to escape. I wanted to go home, but didn’t know where that was anymore. Santa Barbara, like St. Louis, was no longer the place I remembered, my friends scattered across the globe. While the world went on changing without mercy for my memories, Fire Island remained a sanctuary of sameness. “Just call Nancy,” she encouraged over the phone, one sweltering summer Saturday morning. “Tell her you feel like going out.” I felt self-conscious about showing up without my mom, or at least an invitation as Hannah’s weekend playmate. But my tiny apartment seemed to be shrinking in the summer heat, a convection cooker of urban anxiety. There, in desperation, I did something completely counterintuitive. In a kitchen approaching 100 degrees, I preheated the oven. I got out a stick of butter, knowing it would be soft by the time I returned from the corner with evaporated milk and paper muffin cups. A few hours later, I fought the Penn Station frenzy and caught a train to Long Island, arriving just in time for the 11:05 ferry to Saltaire. As I approached the house, David kept swishing the broom across the deck, not noticing as I opened the gate. Nancy glanced up from her book, saw me toting two Tupperware containers of blueberry muffins, and quietly gasped. Preheat oven to 350° and line muffin tins with paper or foil muffin cups. In a large bowl, mix flour, sugar, and baking powder. Cut in 1/2 cup butter and mix very well, until the consistency resembles coarse cornmeal. Take 1 scant cup of mixture and set aside. Add eggs, evaporated milk, and vanilla to the large bowl and mix until smooth. Gently fold in blueberries. Spoon mixture into 24 muffin cups. Melt additional 2 tablespoons of butter and mix with scant cup of flour mixture set aside for crumb topping. Sprinkle over tops of muffins and bake for 20 to 30 minutes, until just golden at edges. A version of this piece was first published in Gourmet Live, in April of 2011.